Pineapples are juicy, mildly acidic, and very versatile. They can be squeezed for juice, sliced on cakes, skewered and grilled, or eaten raw without adornment. Select only ripe pineapples; they stop becoming sweeter once they’re picked. 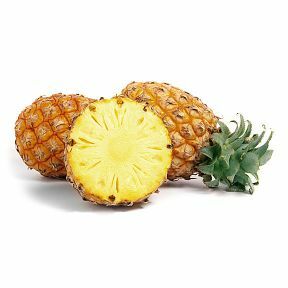 A new variety, the golden pineapple, is sweeter, juicier, and richer in vitamin C than ordinary pineapples. Canned pineapple is an acceptable substitute for fresh in many recipes. Source: Central America, South America. Handling: Stored at approximately 45°F in relatively dry environment. Ripen at room temperature.